Inspired by sunshine, the wind, and the water. This is acrylic on 6 x 6″ canvas paper by Strathmore. I hope you enjoy and have a wonderful weekend! Peace and sunshine to you. Lovely Laura – and same to you! Thanks, Vicki! I really appreciate your visit and comment! What a beautiful wind(dow)! I hope you have a lovely week-end too! Peace and Sunshine to you Laura! lol thank you so much Jill! I really am enjoying the canvas paper too! I am feeling very safe with the 6 x 6 but I recently bought a 9×12″ canvas paper pad I’d like to experiment with too. I don’t know how you paint so large! Did you start out painting large too, or did you start small and gradually build? I recently bought some v large (for me) canvases on clearance at Blick and can’t work up the courage to even think about painting on them yet. But looking forward to growing into them. Do you use an easel when you’re painting big? Love it! Love it! Wow! Kirk, you’re so kind! :)) You are probably my biggest fan when it comes to these windows! So glad you stopped by! 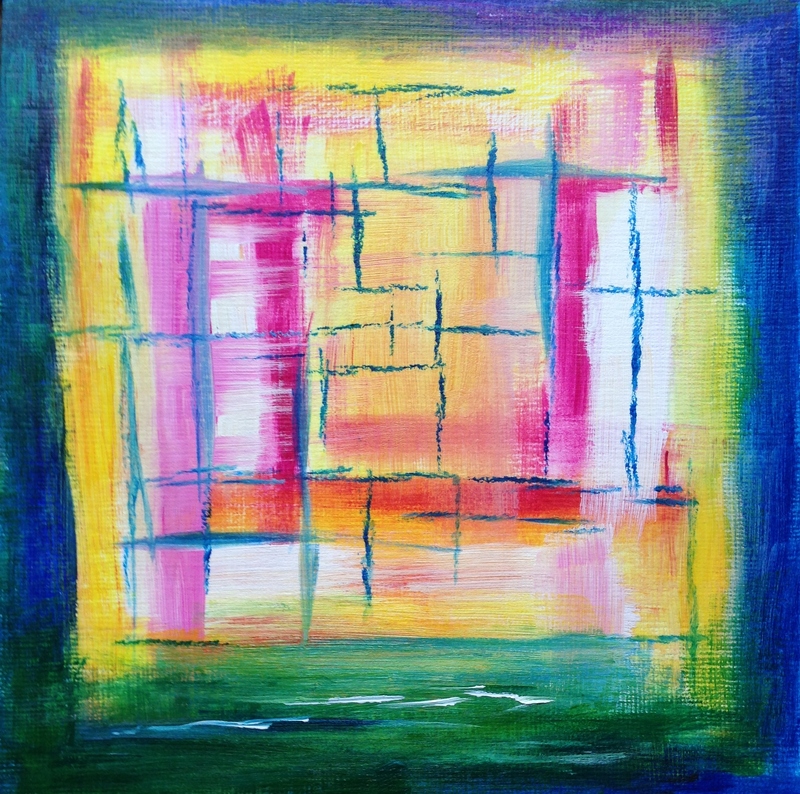 Hi Laura, I love your series of abstract 6×6, they will make a nice collection hanging on your wall. Your color selection is brilliant and uplifting! Thanks so much, Sharon! I’m hoping to open a shop with these as part of goods for sale, as they seem to get a nice reaction here on WP! Not sure if it’s a “no-no” to sell art on paper canvas? But I don’t see how it’s much different than watercolor paper. Any thoughts? Thanks so much, Sharon! I think this is a wonderful idea and will definitely be looking into it. Not sure if they make standard mats for a 6×6″ piece, so I may need to find a cutter & learn how to cut my own! That should be fun lol! great inspirational series Laura ! hey, have you thought about Society 6? download your design, and it doesn’t matter if its on canvas, paper, etc… ( A Thought!!) other than my own lack of tech skills, I like Soc6 but there’s some others I’m now looking at to add to as well. Thanks so much, Steven! So glad you like. I am definitely going to be creating more windows in different color families, as I’d like to open a shop offering these as small (therefore affordable) paintings, and I’d like my work to appeal to a broad audience. I always appreciate your time and feedback. I sure hope you’re successful… everyone needs more beautiful colors, and you certainly provide them. You’re very kind, thank you Steven! And thanks for inspiring me with your amazing photography gift! what a beauty this is!!! Are you thinking of putting all of these together in a grouping? How beautiful that would be!! ☺️. Sold a painting and 3 boxes of cards on etsy yesterday 😝. Congratulations! You seem to really be enjoying it! I’m not sure the printing, packaging and shipping part is for me, which is why I’m thinking VIDA & S6, but I figure it’s worth trying it just to see? Hopefully it’s not too hard to figure out how to set it up, etc. Glad you’re doing so well with it! Thanks so much, Teresa! I consider that a high compliment! I’ve always admired stained glass windows for years. Thanks as always for your encouragement and visits! Your window glows with light and color…great start to the weekend. Peace. Thanks so much, Haunani! Let there be light! You know, these would make great textiles too. Applique and stitching. Thanks, Kerfe! Do you mean if they were appliqued to something larger? I meant taking the images as inspiration for a textile piece. I could see layers of fabric with stitching on top. Yes the Mets had quite an inning last night! Let’s hope both teams can keep it up. Thanks, Rebecca! Yes, this is the painting I went for using the pink and yellow from “Whisper”, but with titanium buff instead of white to tint the colors. I was wondering what you would think of it! Laura, I love how you softly indicated waves of white crests connecting your other two elements, wind and sunshine very well. There’s nothing more wonderful than the way the waves refuses to stop kissing the shoreline. What a wonderful way of saying that Connie! I hope Michigan is agreeing with you! Thanks for stopping by and encouraging me! We’ll be home sometime tomorrow. Still a touch of asthma. I haven’t had this much trouble since, gosh, I can’t remember, that’s how long it’s been.